St Edward’s Press started publishing in 1993. Its first work was an annual calendar showing Saints days, with particular emphasis on British Saints. The mission of St Edward’s Press is to publish any book which seeks to tell the truth – especially about history. 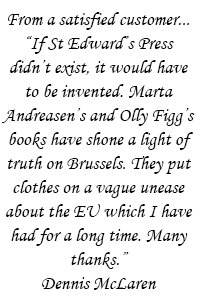 Its more recent publications have been From Ur to Us – Everything you need to know about History, which one history teacher said would be the first book he would rescue from his library if it caught fire – and 101 Reasons why We Should Leave The EU, a contemporary booklet which sold over 38,000 copies. The press’s latest publication is British History – An Illustrated Guide, launched on 7 December 2016, which has been described by an eminent historian as a “wondrous book”. Work is currently underway on an illustrated History of the World as a companion piece to the British History volume.